I am 46 years old and was diagnosed with Bowel Cancer in October 2008. I had an operation to remove half my bowel and this was followed by 6 months of Chemotherapy. After my chemotherapy I wanted to do something that I could look forward to and would encourage me to get fit and strong again. A year before my diagnosis I had trekked to Everest base camp in Nepal and a friend from the trip invited me to join him on an expedition to climb Mera Peak, the highest trekking peak in Nepal at 6400m (21,246ft). 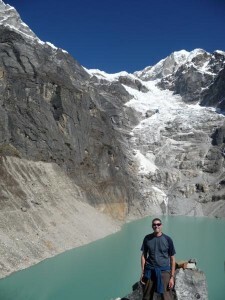 I’d heard about Challenge Cancer through Adventure from a friend and contacted them. As I wasn’t working at the time CCTA provided me much needed financial support to enable me to do the trip. After flying into the remote airstrip of Lukla in the Khumbu region of Nepal, three of us and a huge support team trekked through bamboo and rainforest on paths that had not been used for years (due to landslides). We saw lemur monkey’s and eagles. The days were arduous; the paths never seemed to contour the hills, they just seemed to go up over the ridges then down to river beds then up again. Once we got over 5000m the trip had a different feel to it. We started to really feel the altitude, giving us headaches and sleepless nights. It was also much colder, we were camping in temperatures of -10 to -15 degrees. 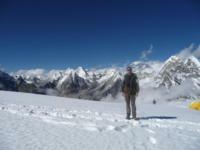 We trekked up though the snow fields to our base camp on the Mera La glacier at 5300m. 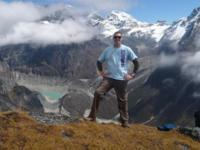 We then made our way to our spectacular high camp perched on a rocky rib ledge, a few hundred metres above the glacier. The mountain scenery was spectacular with fantastic Himalayan panoramas of the high peaks of Everest, Lhotse, Nuptse, Makula, Kanchanjunga and Ama Dabalam. We left our warm tents for the summit in the dark at 3 a.m.. It was -15 degrees and a tad windy! Unfortunately, the altitude started to really affect me on summit day and at 6100m I reluctantly turned back. Nevertheless the trip was a fantastic experience but more importantly it was a key part of my recovery programme and I am now back at work.